Jephta Bowoto popularly called Akpororo, in a recent interview opened up on how hunger pushed him to become a comedian. 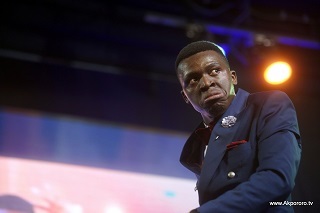 Four years ago, if you mentioned the name 'Akpororo', most would've just shrugged in ignorance of who he is, but today, that name evokes memories of a fast rising standup comedian, whose performance has been described as energetic, crazy, ingenious and hilarious among others. Born Jephta Bowoto, the Ilaje-born Warri native of Delta State, in an interview published in Daily Trust's Weekend Magazine, opened up on how he came about his stage name 'Akpororo', what motivated him to start comedy and the joke that launched him to limelight. How did you choose Akpororo as your stage name? Akpororo: One day I was raining abuses on a guy in church and I said to him: 'You wey your head look like Akpororo' [sic]. My bishop then looked at me and said 'why don’t you change your name from Holy Son to Akpororo?' That's how the name became mine from that day onward. Was it Lagos that exposed you to comedy? Akpororo: No, it was hunger. Hunger, hunger made me start comedy. You just need to find something to eat and do. I have been doing it for about four to five years now. My first pay was N1, 000; the guy paid N600 and has never paid the balance. I came to Lagos in 2009. And comedy was not anywhere on mind at the time to make a career of. I really didn't have an ambition in entertainment at the time because all I wanted to do was stay in Warri. But my mum made me leave and go to Lagos to stay with her brother. It was in Lagos I started comedy. While in Warri, I loved to dance and sing. At any of my shows I always dance. That is what makes me complete and an all-round entertainer. Beyond hunger, did you have a passion for comedy or was it something in the horizon you knew you would end up doing? Akpororo: No, not at all. Akpororo; Singing is something I will always love to do ... when I watch a movie and narrate it to my friends, a lot of them are surprised and admire how I give vivid descriptions of the movie. Even when they watch it, a lot of them still come back to me and say they preferred my narration over what they saw. That is how we started with teasing and 'yabbing' ourselves. In no time it grew into what it is now. What exactly is it you would say shot you to limelight? Akpororo: I broke in with one joke which talks about a mad man who went to a church to give a special number. I shared this joke at the 'Laugh and Jam' organised by Basketmouth. It was a joke that just came about. In my church we have a programme we call, 'E-mad men'. We take care of mentally ill people. We don't discriminate. But when you hear me talk about madmen, it is because I have studied them. When you hear me talk about pastors, it is because I am a church boy. Anything you hear me talk about, it is because I studied the subject; except those I consider freestyle and some which may just come on the spur of the moment. I stood out because there was nobody doing such a comedy. That is what made me stand out in the industry.